Rated 4 out of 5 stars.979 total votes. 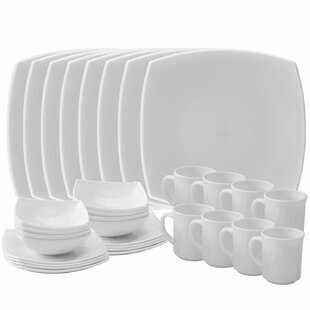 Gear up for casual family meals and dinner parties alike with this 16-piece dinnerware set, complete with dinner plates, salad plates, 32-ounce bowls, and 12-ounce mugs to serve four. Crafted from earthenware, each piece is safe to put in the microwave and dishwasher, making reheating leftovers and cleaning up after brunch a breeze. Though this set’s solid hue may seem understated at first, rim embellishment rounds out the look with a dash of distinction. Rated 4.5 out of 5 stars.7 total votes. Rated 4.5 out of 5 stars.245 total votes. Rated 5 out of 5 stars.16 total votes. Rated 5 out of 5 stars.2 total votes. Durability and shatter-resistance make it perfect for everyday use, indoor and outdoor entertaining, kid-friendly. Set includes four plates in pink, blue, green and purple. All plates are non-toxic and BPA-free. Rated 3.5 out of 5 stars.4 total votes. Perfect prints for any and all occasions at homes, hotels and restaurants alike. Rated 4.5 out of 5 stars.2 total votes. 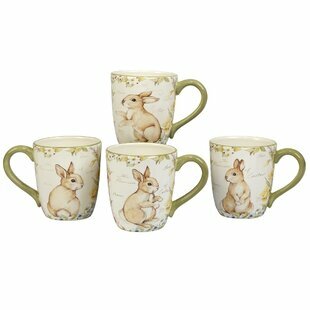 These Rockford Bunny 2 Piece Coffee Mug Set are large, sturdy ceramic coffee mugs with a flair for Easter. They feature springtime hues in pink and green with colored interiors colorful eggs lining the rim. 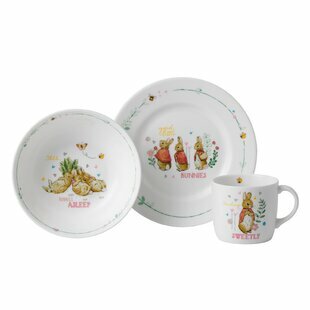 These mugs are both dishwasher and microwave safe and are sure to bring some springtime cheer to your home or office. Rated 4.5 out of 5 stars.55 total votes. Classic shapes pastel background make the Toulouse dinnerware collection perfect for year-round entertaining. Accented with an antique glaze and floral accents, this versatile pattern is made of durable stoneware and is dishwasher and microwave safe. 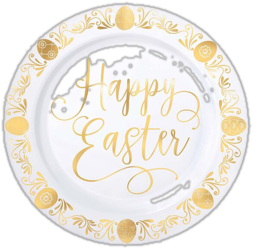 Happy Easter themed large, oval plates feature adorable little eggs and flowers with a decorative Easter themed border that all your guests will be talking about. Perfect for any Easter-themed get together, this Lovely Easter 12" Dinner Plate features pastel eggs, tiny plants, flowers and a whimsical border design. Happy Easter features prominently. Rated 5 out of 5 stars.7 total votes. Rated 5 out of 5 stars.13 total votes. This Gandara Cute Rabbit Cotton Table Runner features a colorful pattern to help you create a fresh spring look in your home. Digitally printed on demand, this design displays vibrant colors. The result is a beautiful design you're sure to love. Rated 5 out of 5 stars.4 total votes. The Danhui Tablecloth features classic stripes. This versatile tablecloth is reminiscent of casual French dining and perfect for year-round use or special holiday gatherings. This artful Celebration Easter Egg Porcelain Appetizer and Candy/Nut Bowl will add a touch of fun to any room, made to showcase your delicious spring and easter appetizers and snacks. Set this attractive dip bowl next to some healthy snacks during an easter egg hunt or use it as a small candy or nut bowl. Overall Product Weight: 0.52 lb. This tablecloth is perfect for holidays, Christmas parties, dinners, everyday use and more. Machine washable for easy cleanup and use. Let your dinnerware stand out with a colorfast, wrinkle-resistant tablecloth, sure to make a statement for family and guests. Your table can be dressed up or down to create the perfect place setting, whether for a family gathering or holiday party the can be used indoor or out. Decorate your table for Easter with this Easter Bunny Tablecloth. 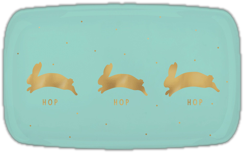 This cute light blue tablecloth features an all-over print of bouncing bunnies and polka dots and helps protect your table from spills and hot dishes. When the meal is over you can remove the cover to reveal your clean table underneath. Rated 5 out of 5 stars.11 total votes. 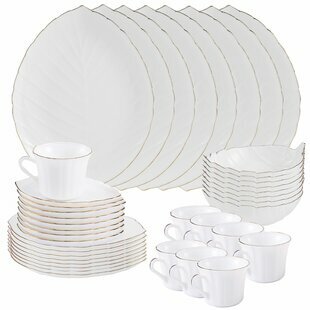 Classic shapes on pastel background make the Toulouse dinnerware collection perfect for year-round entertaining. Accented with an antique glaze and floral accents, this versatile pattern is made of durable stoneware and is dishwasher and microwave safe. This Choi Floppy Eared Coffee Mug features an adorable floral bunny design printed on both sides of the mug to help you add style to your beverage this Easter. This Choi Floppy Eared Coffee Mug makes a stylish and functional accessory. The result is a great gift for friends, family, and even co-workers. Rated 5 out of 5 stars.6 total votes. Cute and practical, this Easter Egg Flannel-Backed Vinyl Tablecloth is easy cleanup but flannel backed for extra sturdiness. Get your Easter game in gear with this flannel backed Easter tablecloth in easy-clean vinyl. Featuring a classic pattern of gingham and striped eggs in pastel colors, everyone will be asking you where you managed to find it. Rated 4.5 out of 5 stars.5 total votes. Bring a classic look to your spring dining with this Rabbit Toile Runner. A soft print composed of blue bunnies and daffodils sits atop an off-white cotton ground. Machine washable for easy care, this timeless collection adds classic style to your spring decor. Crafted of cotton this runner is machine washable for easy care. Rated 1 out of 5 stars.1 total votes. 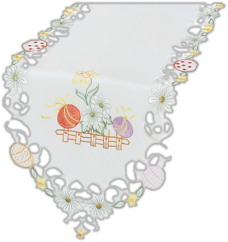 This Lovely Easter Tablecloth feature adorable little eggs and flowers with a decorative Easter themed border. You can dye your eggs without worry when you use this Easter themed table cover featuring colored pastel eggs, tiny plants, flowers and a whimsical border design. Happy Easter features prominently. Why drink out of an ordinary mug when a custom printed mug is so much cooler? This ceramic mug is lead-free, microwave safe and FDA approved. Hand washing is recommended. Rated 5 out of 5 stars.5 total votes. 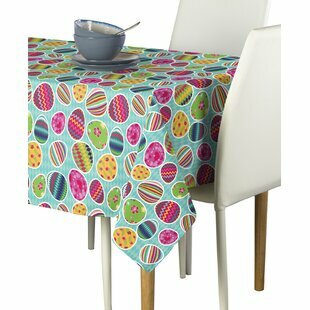 The Fleeman Easter Egg Tablecloth combines with additional decor to complete the look. The Fleeman Easter Egg Table Runner combines with additional decor to complete the look. Rated 5 out of 5 stars.14 total votes. 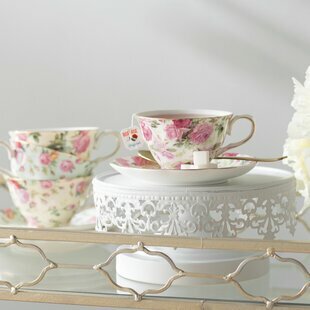 Add a stylish touch to your table with this 4 piece completer set from Red Vanilla. The lovely Dutch Garden porcelain pattern finishes this colorful set. Overall Product Weight: 8 lb. Set the scene for an Easter brunch soiree or a dinner party with this charming nesting bowl set, featuring an egg design. Overall Product Weight: 0.35 lb. Rated 4.5 out of 5 stars.14 total votes. Add a stylish touch to your table with this 5 piece completer set from Red Vanilla. A lovely floral pattern in porcelain finishes this colorful set. Rated 5 out of 5 stars.32 total votes. Rated 4 out of 5 stars.1 total votes. Rated 3 out of 5 stars.1 total votes. 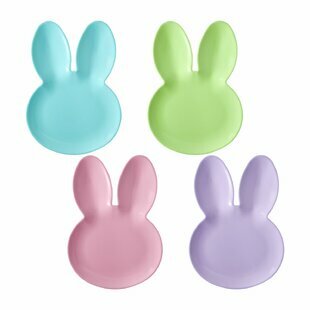 Everyone will be so happy that spring has sprung when you decorate your table with this Easter Hello Bunny Plastic Tablecloth. Made of sturdy plastic this cover is sure to keep your table clean from spills or egg dye. When they get together is over simply wipe the table down with a damp cloth and store it away for next time. Rated 5 out of 5 stars.70 total votes. 4 Colorful dessert plates... countless uses. Each 4 Piece Butterfly Meadow 8" Dessert Plate has a different pastel rim, each has a different butterfly at its center, and all have gracefully scalloped rims. Use the plates to serve dessert, sandwiches, snacks, and more. Or, mount the plates to a wall as a cheerful grouping. Get your home holiday-ready with this table runner. Digitally printed to display vibrant colors, this tabletop decor will help you create a fresh spring look in your home. This Easter Folk Stripe Embellished 20" Napkin is the perfect color for your table. The table runner and tablecloth is giving a complete look for your home. Kids of all ages will feel the magic of Easter when they see the charming images on this Bunny Plastic Tablecloth. The plastic tablecloth is solid white with a printed trim featuring cartoon Easter bunnies. This tablecloth is pair with all Easter bunny party supplies. Their runners can be used as accents to dining room tables, cocktail tables, or dressers. They offer protection for furniture. Show your style by purchasing one of their unique designs. At Wayfair, we carry a wide selection of easter entertaining so you can choose from many different options for your home. We carry the best easter entertaining products, so you can find one that is just right for you. With our large selection of home goods, you're likely to find something that you'll love. If you're looking for where to buy easter entertaining online, then you'll have no trouble finding a great option on Wayfair!